Yesterday was an exciting day for me. I got to meet a backyard “henner” from Toronto. 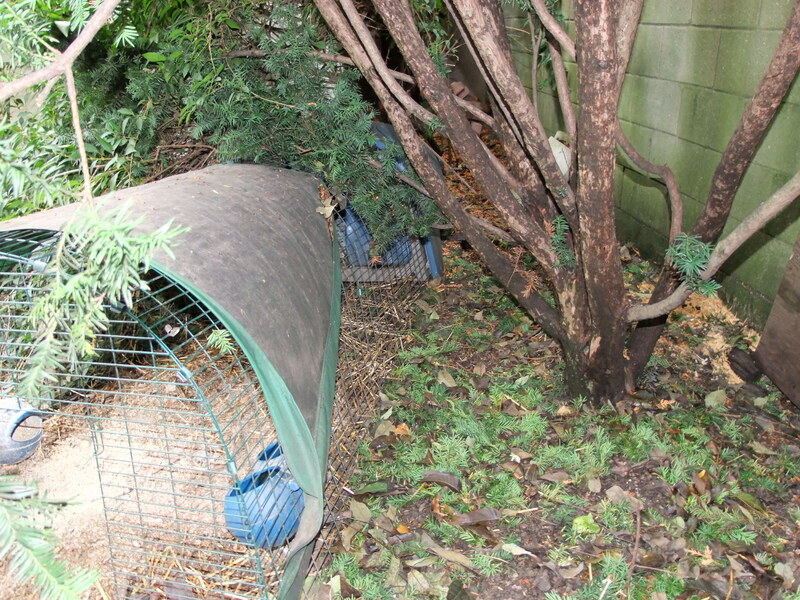 This was a bit of an event, since it was necessary to develop a little bit of trust before the meeting could even take place, because technically, it is still not legal to have hens in the city, and whoever hosted me was at risk that I could report them and have their hens confiscated. The Egg Farmers of Ontario had asked me to work with them to help the City of Toronto develop a responsible set of rules for allowing backyard hens in the city. Through these contacts, I was introduced to Lorraine, an active participant in the grey world of quasi-legal farming in the city. I visited Lorraine’s home with a representative from city council who is working to develop a policy for the city that will accommodate backyarders, and keep them, their neighbours and the hens safe and getting along. Lorraine turned out to be the perfect representative for the backyard henners! She was open, honest and super-accommodating to me and the city official. We were welcomed into her home, her backyard and her coop. We spent over an hour talking about the pros and cons of henning, and tried to help the city official understand the needs of backyard hens. I asked Lorraine what her biggest challenges were with respect to maintaining her flock, which usually numbers between 2 and 3 hens. Her yard is a riot of different flowers, vegetables, shrubs and trees. Besides a path down the middle of the yard that leads to the coop, there is little grass. 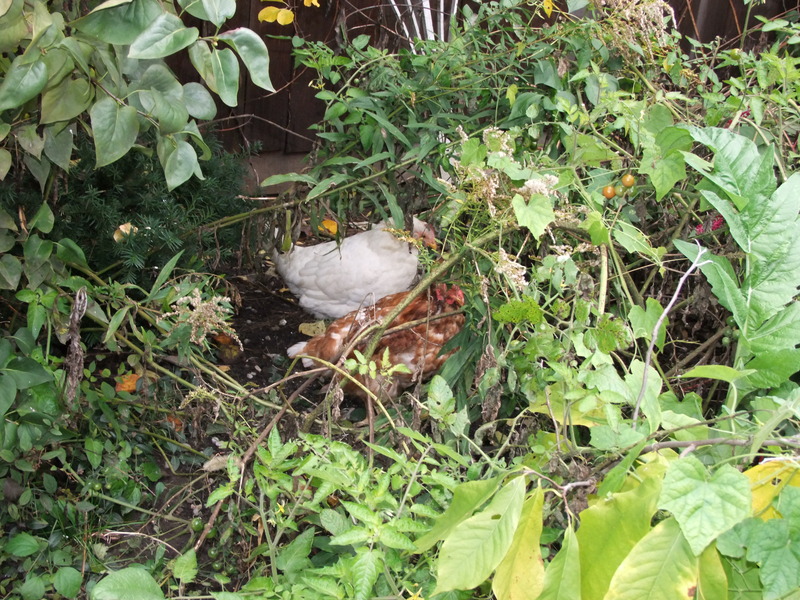 As such, Lorraine has no problem disposing of her manure as organic fertilizer, and it looked to me (no gardener here!) like the yard was thriving. Lorraine's hens amongst the riot of plants in her backyard/garden. She told me that getting good quality chicken feed was not much of a trial either. Despite not having a car, and her source of feed being 15 or 20 miles away (which, in Toronto is an epic journey!! ), the group of backyarders have such a co-operative group that anyone who is going to get chicken feed will come back with extra, and then distribute the extra to others who are running low. Lorraine even talked about an idea that was being floated that one of the Toronto chicken keepers would order in a pallet of feed, keep it in a garage, and act as a “depot” to the group. Lorraine also pointed out that the group covers for each other….”hen-sitting” for vacationing friends and sharing tips and tricks. I asked how she managed her flock in the winter, and she told me that she wrapped her coop in bubble-wrap, and had a heat lamp ready, but the insulation was enough that she didn’t need to plug it in. Lorraines coop….eggloo in the back, then the half-moon run that she bubble-wrapped in winter. The hens had a larger run, then access to the backyard too. Bubble wrap. Really. I think this is the thing that I enjoy most about interacting with backyard hen keepers. I loved the show McGuyver when I was young. He could take a swiss army knife, a stick of chewing gum and a coat hanger, and make a missile out of them. That is what backyarders do. Bubble wrap is phenomenal insulation….its also water-proof, doesn’t completely block the light, and is cheap and available. I would have NEVER thought of using it for this purpose, but it is ideal….Love it. The biggest concern Lorraine had, and she said was the same for many of her henning friends was medical care. She was unsure what to do if one of the hens got sick….how to treat…what to do with the eggs after treating….who to call in an emergency….etc, etc. I feel that this is something I can help with, and am working on a way to assist the Toronto chicken keepers group in some way. I was able to help Lorraine with her hens, and hope to be able to pass along some advice to others in a similar situation. There is a real opportunity for someone like me to fill a gap and help both the people involved and improve the welfare of the hens they keep. In summary, I would like to thank Lorraine again for hosting me and illustrating how invested people can be in their hens; the City of Toronto staff for diligently working on a responsible bylaw to make henning “work” in Toronto; and the Egg Farmers of Ontario for helping me get together with a group of people I would never have met otherwise. There is a lot of potential here for mutual learning and benefit. This entry was posted in Backyard Flocks - General Info and tagged backyard chickens, chicken, chickens, coop, eggs, everything eggs, laying hens, poultry, vet, veterinarian. Bookmark the permalink. I’d like to find out where I can buy chicken feed for egg-laying chickens in Toronto. Any tips?